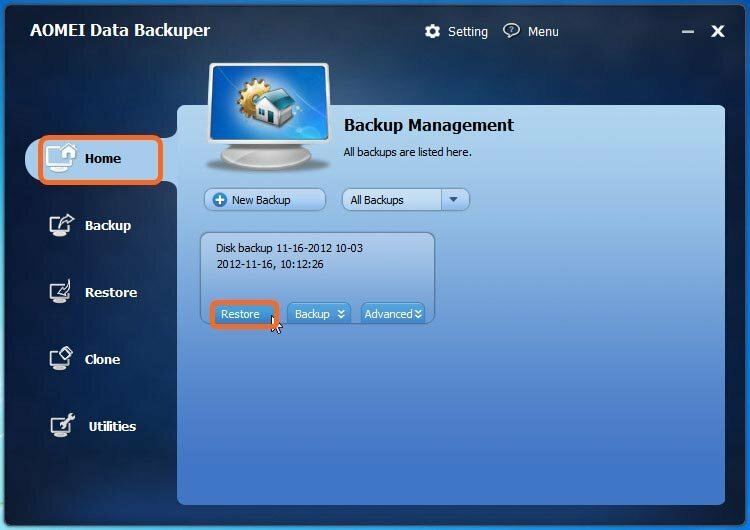 As for the problem of how to restore disk, a powerful tool-AOMEI Backupper can resolve it easily and safely. It supports all editions of Windows operating systems since Windows 2000. When a disk has been used for a period of time, there will be inevitable data loss more or less. Most of the data might have played an important role in a corresponding field. So the method of disk recovery can be an optional choice in data protection. However, there is a precondition of disk recovery. That is, there must be an image file of the disk created in advance. As a result, we can know the importance of disk backup as well. You can get a specific acknowledgment from the article-"disk backup". There are several disk problems that may result in data loss as listed below. As we all know, in this developing information age, the various viruses may lead to data loss at any time. Due to some reasons, the prompts shows that you need to format the disk or it can not be accessed. Then, after the formation, all the data on the disk will be lost. The disk might be unreadable due to some wrong operations. Then there will be data loss on the disk. The data loss might be result from the problem of "bad track" and "bad sector" on the disk. If the prompt of "invalid disk" appears, it is necessary to format the disk. As a result, the data on the disk will be lost as well. As for all the situations mentioned above, disk recovery is emergently needed. At the same time, this also informs us that it is necessary to do disk backup at any time. Because data losses result from any disk problem all can be restored excellently only if we have a backed up image file. AOMEI Backupper can meet the basic needs of most users. It can complete both disk /partition/volume restore and backup excellently. 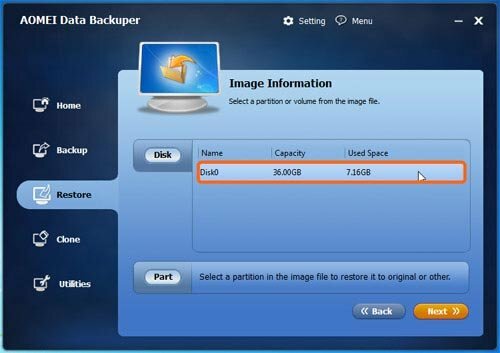 By reading the articles of "Partition and volume backup" and "Partition and volume recovery", you can know more information about it. This professional software can work with all the editions of Windows operating system since Windows 2000. Moreover, whether it is an MBR or GPT, internal or external, basic or dynamic disk, this program can work ideally. As what has been mentioned before, there is a precondition of disk recovery. That is we should back up the disk to an image file in advance. If you do not have the backed up image file, the operations of disk recovery can not be carried out successfully. You can refer to the article mentioned at the beginning of this article to know how to carry out disk backup perfectly. In order to ensure the safety of the image file, you can burn it to CD/DVD. Here Come the Detailed Steps of Disk Recovery As Follows. Tip: You should have created a backup in advance. And then, download this freeware , install and launch it. If your system fails to boot, you can create a boot media with USB drive or CD without AOMEI Backupper and boot your computer to restore your hard drive. Step 1: you can begin restoration by choosing a backup that you want to restore through two approaches. 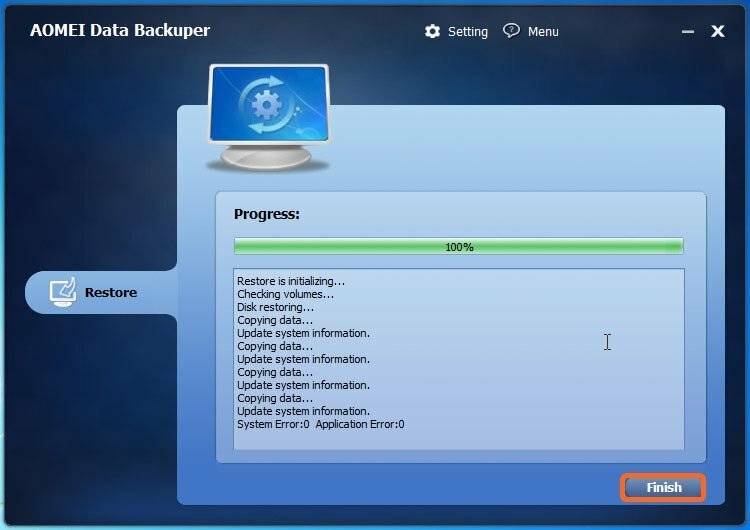 In the "Home" tab, click "Restore" option of a corresponding backup task. And then, it will skip to the restore tab. All the backup version of the selected backup task will be listed. Select the one you want to restore, and click "Next". In the next interface, you can select a time point of this backup task to restore, and then click "Next". 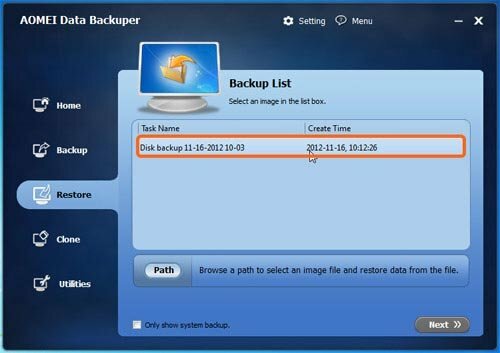 Step 2: after choosing a backup version, you should select the source disk in the image file, and then click "Next". If you want to restore it from incremental backups, you can select the latest incremental backup file to restore. 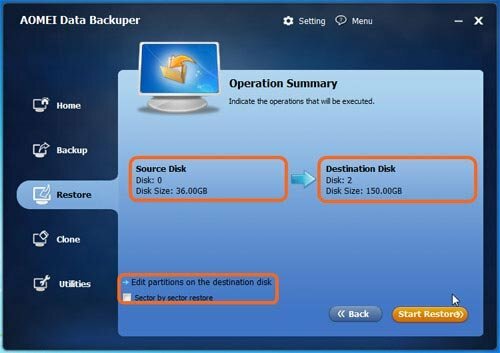 Notes: The data on the destination disk will be overwritten, so make sure that you have made a backup of important data or just transfer it to another place. Step 4: the source disk and the destination disks will be listed in this step. Confirm the operations and click "Start Restore". You can resize the partition size on the destination disk by clicking "Edit partitions on the destination disk". It includes three options: clone without resizing partitions, fit all partitions to entire disk and edit the partitions on the disk. The item of "Sector by sector restore" is optional. Step 5: click "Finish" when the operations have been completed. if there is any program on the destination disk is running, the program will prompt you to terminate it. But if it can not be terminated, this software will prompt you and automatically restart the computer to finish the operations, which is called "Restart Mode". With the backup and recovery utility of AOMEI, you can choose to restore a whole disk, or just a partition, even some selective files. You can get more information through the article "Selective file restore". 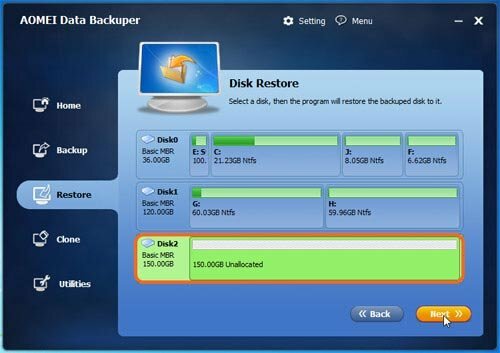 It can also restore disk to different storage devices as well, such as restore HDD to SSD. When this software starts, all the previous backup tasks will be listed in the "Restore" interface, then here you can restore the image file by either choosing a corresponding task or opening the image file.